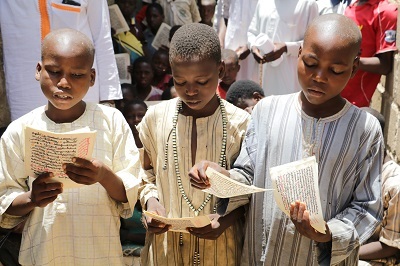 Northern Nigerian Quranic School also known as Tsangaya Education or Almajiri School is a concern that has received great attention over the last ten years in educational policy statement/decision,academic discourses, seminars, conferences and political campaigns. Despite making the Almajiri predicament a topic of national discourse, there are still several challenges associated with improving the system and a seemingly weak political will to implement decision taking. The current pattern of running the school system doesn't provide these children possibility of a bright and successful future. Hence, the Almajiri child is at high risk of falling victim to radicalization and negative influences. Farar Tattabara’s Ilimi Abin Nema program is therefore aimed at interrogating and discussing the challenges affecting the Almajiri and Tsangaya school system, as well as the role of government, parents and other stakeholders in ensuring quality life and education for Northern children. The program provides an opportunity for interaction with Ulamas, parents and community leaders to understand the factors informing parents’ decision to send their children to Tsangaya, and also create dialogue around combining the Islamic and formal systems of education that will ensure that these children have an opportunity to a promising future. Beyond the discussion, the program also does an in-depth analysis on the lifestyle of children that are sent to the Tsangaya School, the lack of curriculum, the nonexistence of basic amenities, and the structures that expose these young children to various societal and moral vices. The program provides a platform for dialogue that results to finding lasting solutions to the problems faced by these young children. Feedback from Ulamas show that several Tsangaya schools now incorporate non-Quranic subjects into their curriculum such as mathematics, English, and life skills after realizing the added value of such learning to their programs and the lives of the students. During the Mid-Line Research, dozens of Tsangaya teachers who were interviewed said they no longer send their students out to beg on the streets as a form of subsidizing the cost of learning, while parents have reported being in close touch with their children in Tsangaya schools. These changes in attitude and curriculum were supported by religious leaders and parents. We hope that this continuous change in attitude will reduce the sense of isolation and abandonment felt by young Tsangaya students who fall prey to violent extremist organizations (VEOs) and their rhetoric.